A while ago I bought the book “Knit Your Own Zombie”( by Fiona Goble from Ivy Press) for my daughter. She thought the idea was great and she started making some of the dolls, but never finished any of the projects and the book ended up in the craft room on the bookshelf with a few hundred other craft books. 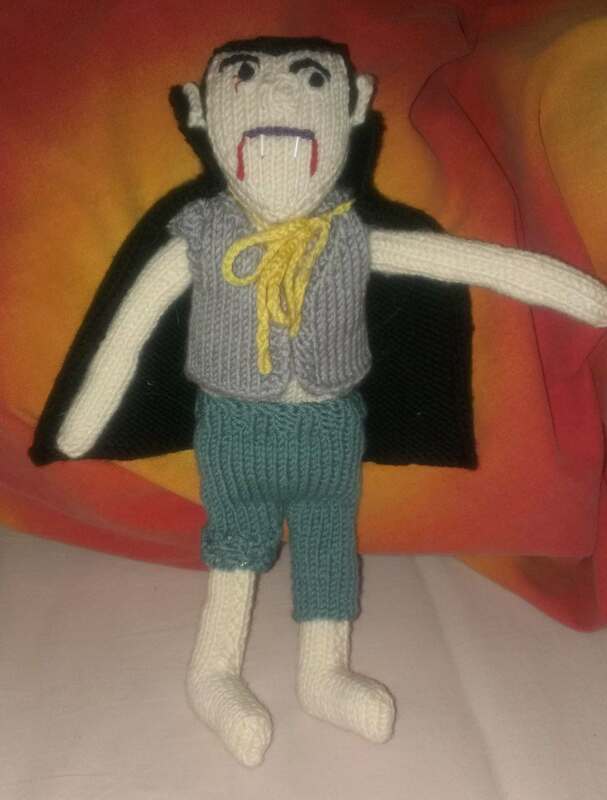 The Count is about 25 cm high and sports an elegant waistcoat (I still need to find suitable buttons for it) and a dramatic cape. His trousers have, unfortunately, seen better days (he was attacked by some village dogs while out hunting one night). His head is attached with Velcro to the body and the upper and lower body can also be ripped apart (they are also joined with Velcro fasteners). The arms attach to the upper body with snaps so that they can also be ripped off, one by one, if you are in that kind of mood. Up next are a few of the more “rotting” Zombies…We’ll see how they turn out. YarnCamp on 15 September in Frankfurt This Zombie wants my Droid!